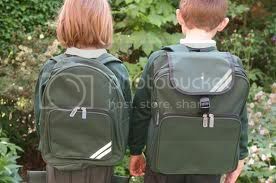 Now is a good time to think about schoolbag safety and your child’s long term musculoskeletal welfare. Because muscles are still developing as a child grows it is important to ensure efficient and symmetrical development in order to prevent muscle imbalances which can lead to postural deformities. Importantly the bony skeleton is still very adaptable at this age so what is important to strike a balance between a healthy physical stimulus that has beneficial effects and the possibility of overload which may be harmful. One of the most important factors to bear in mind about that schoolbag safety is the duration for which the bag will be carried. A couple of minutes from schoolyard to classroom would be unlikely to cause harm even if heavily loaded whereas 20 minutes with 20% more than the recommended load with increased the risk factor substantially. The recommended weight tolerance should be no more than 15% of your child’s body weight. There are several aspects of bag designed which help to distribute and absorb load and thereby minimize musculoskeletal stress. The following is a list of tips lookout for when selecting a backpack. 1. Broad straps – broad straps distribute the pressure across the shoulders more evenly. This reduces the chances of compressing the muscles joining the neck and shoulder and irritating the nerves which are located in this area. 2.Padded straps – padded straps at least in the contact points around shoulders will help with load distribution and minimize the risks outlined above. 3. Size – schoolbag should be sized relative to the torso of a child. An easy visual assessment would see the bag located between the base of the neck and above the waistline. The actual capacity of the bag (measured in liters) can vary quite considerably depending on the number of pockets or chambers included. 4. Compartments located in the middle or sides of the bag are generally better than ones added onto the back. In general the deeper the bag from front to back the bigger the leverage on the spine and more muscle work would be required to balance the load. 5. A body strap around base of the bag is ideal but less commonly found on most schoolbags. This helps by providing another point of attachment onto the body and also helps to anchor the bag in position thereby reducing muscle effort required to stabilize the bag. 6. Bag filling – place the heaviest items /books closest to the child’s back to reduce leverage on the spine. 7. Bag contents – try to pack bag contents tightly to minimize movement within the back. This helps to reduce unexpected pressure and a change of bag Position on the back. 9. Bag position – ensure the shoulder straps are sufficiently tight to prevent bag hanging away from the spine. This creates longer leverage and requires more counteracting muscle work. 10. Planning bag load – it is worthwhile purchasing a bag which has compartments which can be used to store items which need quick and easy access to ie pens, pencils sharpeners, rulers, lunch box etc. This prevents constant rummaging through the bag with associated redistribution of the load an efficient packing my well-intentioned parents. One final point of observation is that if you see your child incline forwards to counterbalance the bag then they are unable to manage the weight even if it falls within the recommended guidelines. Unfortunately, some factors are outside parental control regarding the number of books required, storage and transport to it may not always be possible to conform to the ideal. Nonetheless, I hope this article provided some useful background information to allow you to make informed decisions regarding schoolbag safety for your child. If in doubt, your nearest Chartered Physiotherapist could be able to advise you. Check out our blog at Dublin physio for regular postings and useful tips on musculoskeletal health matters.